States commended as “low-tax” are often high-tax for low- and middle-income families. The 10 states with the highest taxes on the poor are Arizona, Florida, Hawaii, Illinois, Indiana, Iowa, Oklahoma, Pennsylvania, Texas, and Washington. Six of these are also among the “Terrible 10” because they are not only high-tax for the poorest, they are also low-tax for their richest residents. The nation’s public policies helped grow the middle class, improve public health and economic well-being, build the Interstate Highway System, and make access to K-12 education universal. Just as public policy has the power to improve well-being, the inverse is also true. Over the past four decades, wealth has increasingly concentrated among the highest-income households. The reasons are complex and vast, but legislation, regulation, and federal court rulings certainly have contributed. State and local tax policies play a role in this persistent social problem. The vast majority of state tax systems are regressive, meaning lower-income people are taxed at higher rates than top-earning taxpayers. Further, those in the highest-income quintile pay a smaller share of all state and local taxes than their share of all income while the bottom 80 percent pay more. In other words, not only do the rich, on average, pay a lower effective state and local tax rate than lower-income people, they also collectively contribute a smaller share of state and local taxes than their share of all income. This adversely affects states’ ability to raise revenue. Research shows that when income growth concentrates among the wealthy, state revenues grow more slowly, especially in states that rely more heavily on taxes that disproportionately fall on low- and middle-income households. Further, tax-cut-heavy policy decisions often deprive state coffers of adequate revenue for vital programs and services that build opportunity and improve overall well-being for families and communities. The movement among teachers in states across the country to demand more investment in education and no more tax cuts, especially at the top, for example, is illustrative of the challenges that states face when they continually cut taxes and either fail to increase spending on vital services or fail to sustain spending at the rate of inflation. This study provides important context for those interested in state and local tax policies and the role they play in funding vital programs and services as well as economic security for all families and communities. It examines tax fairness by providing a thorough analysis of how state and local tax policies affect taxpayers across the income spectrum. It finds that nearly every state fails the basic test of tax fairness, taking a much greater share of income from low- and middle-income families than from wealthy families. This, of course, has broad implications, not only for taxpayers’ after-tax income but also for the revenue states collect to fund basic programs and services. 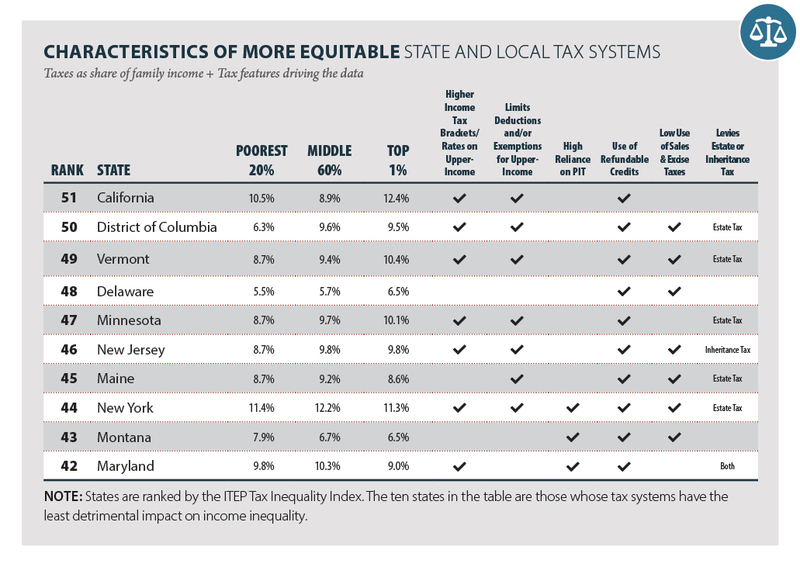 The report shows which states have done the best job of moving toward more equitable tax structures and which state systems are most regressive and further exacerbate income inequality (for additional detail see Appendix B). 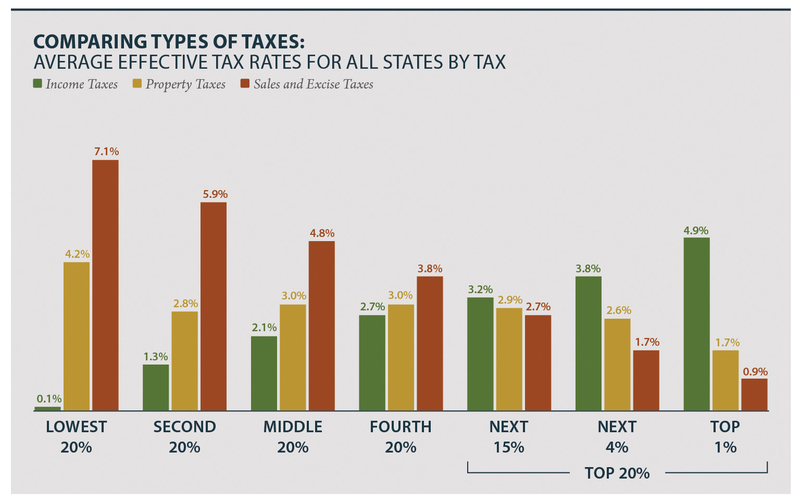 The national effective state and local tax rate is 11.4 percent for the lowest-income 20 percent; 9.9 percent for the middle 20 percent; and 7.4 percent for the top 1 percent (see Figure 1 and Appendix A). This means the poorest Americans are paying one and a half times as much of their income in taxes than the top 1 percent. Results vary widely by state. For detail on the impact in individual states, visit Appendix A for the state-by-state Who Pays? summaries. Forty-five states have regressive tax systems that exacerbate income inequality. When tax systems rely on the lowest-income earners to pay the greatest proportion of their income in state and local taxes, gaps between the most affluent and the rest of us continue to grow. The ITEP Tax Inequality Index measures the effects of each state’s tax system on income inequality by assessing the comparative impact a state’s tax system has on the post-tax incomes of taxpayers at different income levels. Essentially, it answers the following question: Are incomes more equal, or less equal, after state taxes than before taxes? For example, consider this scenario: if taxpayers in the top 1 percent are left with a higher percentage of their pre-tax income to spend on their day-to-day living and to save for the future than low- and middle-income taxpayers, the tax system is regressive and receives a negative tax inequality index score. This indicates that the income inequality that existed before the levying of state and local taxes has been made worse by those taxes. On the other hand, states with slightly progressive tax structures have positive tax inequality indexes. This means that after taking state and local taxes into account incomes are no less equal than they were before taxes; and tax systems in those states, at the very least, did not worsen income inequality. NOTE: See Appendix B for detailed ITEP Tax Inequality Index and Methodology for more information. In Texas, before state and local taxes are collected the top 1 percent of taxpayers earn an average income that is 124 times larger than the average income of the state’s poorest 20 percent of residents. This state’s tax system, which ranks as the second most regressive on the Index, only exacerbates this divide. After state and local taxes are collected, the average after-tax income of Texas’s top earners stands at 140 times the size of the average after-tax income of the state’s low-income residents. This is the predictable result of charging low-income families a 13.0 percent effective tax rate, while asking high-income families to pay just 3.1 percent of their income in tax. The story in New Jersey is very different. 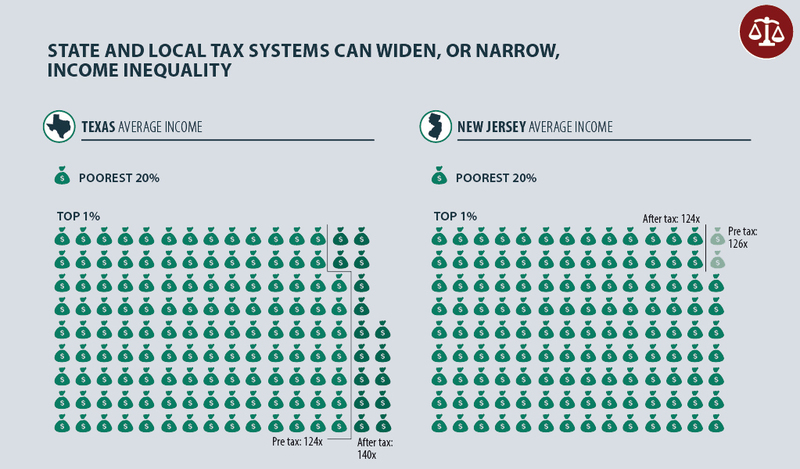 Prior to the application of state and local taxes, New Jersey’s top 1 percent of taxpayers enjoy an average income that is 126 times larger than the average income earned by the state’s poorest residents — a figure quite similar to Texas. But New Jersey’s tax system makes this vast divide somewhat narrower. By asking slightly more of high-income households (9.8 percent of income) than of the poor (8.7 percent of income), New Jersey’s ratio falls ever so slightly, with high-income households enjoying incomes 124 times larger than the state’s poorest residents, on average. This example shows that while state tax codes are not a cure-all for economic inequality, well-designed systems can help lessen the problem while steeply regressive systems only make it worse. Ten states — Washington, Texas, Florida, South Dakota, Nevada, Tennessee, Pennsylvania, Illinois, Oklahoma, and Wyoming — are particularly regressive, with upside-down tax systems that ask the most of those with the least. These “Terrible 10” states tax their poorest residents — those in the bottom 20 percent of the income scale — at rates up to six times higher than the wealthy. Middle-income families in these states pay a rate up to four times higher as a share of their income than the wealthiest families. Seven of the 10 states do not levy a broad-based personal income tax — Florida, South Dakota, Nevada, Tennessee, Texas, Washington, and Wyoming. Tennessee currently levies a limited personal income tax that only applies to interest and dividend income, but it will be eliminated by 2021. Three states do levy personal income taxes but have structured them in a way that makes them much less progressive than in other states. Pennsylvania and Illinois use a flat rate, which taxes the income of the wealthiest family at the same marginal rate as the poorest wage Oklahoma has a graduated rate structure but applies the top rate starting at taxable income of $12,200 for married couples — making the tax virtually flat in practice. Six of the 10 most regressive tax systems —Florida, Nevada, Tennessee, Texas, South Dakota, and Washington — rely heavily on regressive sales and excise taxes. These states derive roughly half to two-thirds of their tax revenue from these taxes, compared to the national average of 35 percent in fiscal year 2014-2015. Ten jurisdictions with more equitable state and local tax systems can be found in Figure 5. 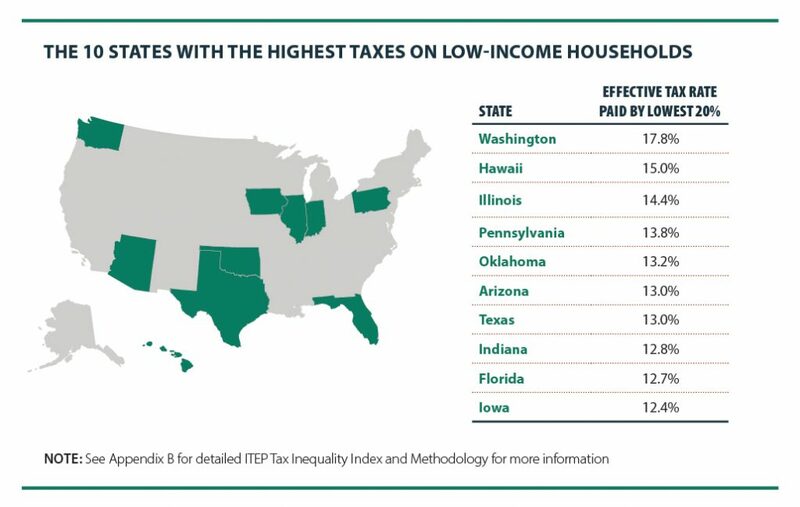 Six of the ten — California, the District of Columbia, Delaware, Minnesota, New Jersey, and Vermont — had positive scores on ITEP’s Tax Inequality Index, meaning that their state and local tax systems do not worsen income inequality. Thoughtful, progressive tax policy decisions permitted these six jurisdictions to make their tax systems somewhat more equitable for those with the least ability to pay taxes. But none of these six tax systems are robustly progressive in a traditional sense. Rather than seeing effective tax rates steadily rise throughout the entire income distribution, some of these jurisdictions see “peaks,” where taxes on middle-income families are somewhat higher than at the top, or “valleys,” where low-income families face higher rates than the middle-class. Highly progressive income tax brackets and rates. All of the most equitable tax systems include personal income taxes which are progressive (but to varying degrees). California’s overall tax system is relatively progressive largely because of graduated marginal income tax rates, additional tax on income over $1 million, and limits on tax breaks for upper-income taxpayers. The use of targeted, refundable low-income credits. All of the ten states with more equitable tax systems have refundable Earned Income Tax Credits; EITC’s in 7 of the 10 states exceed a quarter of the federal credit. Refundable credits to offset sales and property taxes are also common. Maine, for instance, provides a sales tax credit, dependent care tax credit, and a property tax “circuit breaker” that was recently enhanced. Broad-based income taxes. State personal income taxes with few deductions or exemptions to benefit the rich (such as capital gains loopholes or itemized deductions) tend to be progressive. Targeted policy decisions to phasedown or phaseout these benefits for higher-income earners can improve both the progressivity and revenue yield of state income tax structures. A higher reliance on income taxes with a lower reliance on regressive consumption taxes. 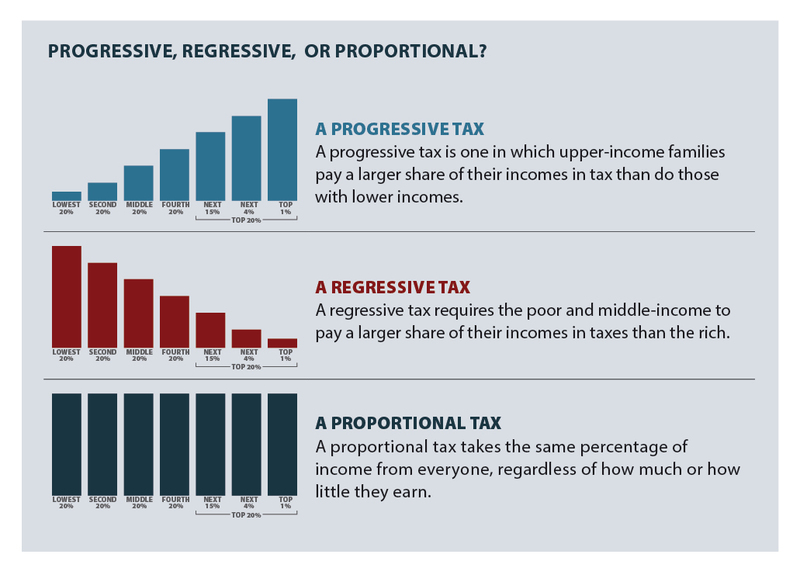 Just as the combination of flat (or non-existent) income taxes and high sales and excise taxes leads to regressive tax systems, the least regressive tax systems have highly progressive income taxes and rely less on sales and excise taxes. State personal income taxes are typically progressive — as incomes go up, effective tax rates go up. On average low-income families pay .04 percent of their incomes, middle-income families pay 2.1 percent of their incomes, and the top 1 percent pay 4.6 percent. Of the three major taxes used by states, the personal income tax is the only one under which effective tax rates rise with income levels. States often use progressive income taxes as tools to help offset more regressive state and local taxes. Property taxes, including both taxes on individuals and business taxes, are usually somewhat regressive. On average, poor homeowners and renters pay more of their incomes in property taxes than do any other income group — and the wealthiest taxpayers pay the least. On average low-income families pay 4.2 percent of their incomes, middle-income families pay 3.0 percent of their incomes, and the top 1 percent pay 1.7 percent. Sales and excise taxes are very regressive. Poor families pay almost eight times more as a share of their incomes in these taxes than the best-off families, and middle-income families pay more than five times the rate of the On average low-income families pay 7.1 percent of their incomes, middle-income families pay 4.8 percent of their incomes, and the top 1 percent pay 0.9 percent. The nation’s longstanding system of unequal opportunities to access education, housing, jobs and capital, and other economic resources has resulted in a stark wealth gap between white families and most communities of color. Median wealth among black families is 10 times less than median wealth among white families. On average, black families earn $28,000 less in income every year than white families and Latino families earn nearly $18,000 less per year than their white counterparts. The distributional impact of state and local tax systems based on income also have clear implications for wealth inequality among racial groups. State tax codes that worsen income inequality by taxing lower-income people at higher rates than wealthy people, taxing income derived from wealth (e.g. capital gains) at a lower rate than income derived from work, or relying heavily on consumption taxes, are worsening the racial wealth divide. The income and wealth gap between white families and communities of color will not be eliminated by making state tax systems fairer, but at the very least policymakers and the public should consider how tax policies are contributing to this persistent social problem. A state’s tax fairness is only partially determined by the mix of these three broad tax types. Equally important is how states design the structure of each tax. By design, some personal income taxes are far more progressive than others. The same is true, to a lesser extent, of property and sales taxes; while any state that relies heavily on these taxes is likely to have a regressive tax structure, lawmakers can take steps to make these taxes less regressive. The overall regressivity of a state’s tax system, therefore, ultimately depends both on a state’s reliance on the different tax sources and on how the state designs each tax. For example, California’s level of reliance on sales and excise taxes is fairly in line with the national average. But it relies less heavily on property taxes and much more heavily on a state personal income tax that is substantially more progressive than most — and this makes California’s tax system the least regressive one in the country. 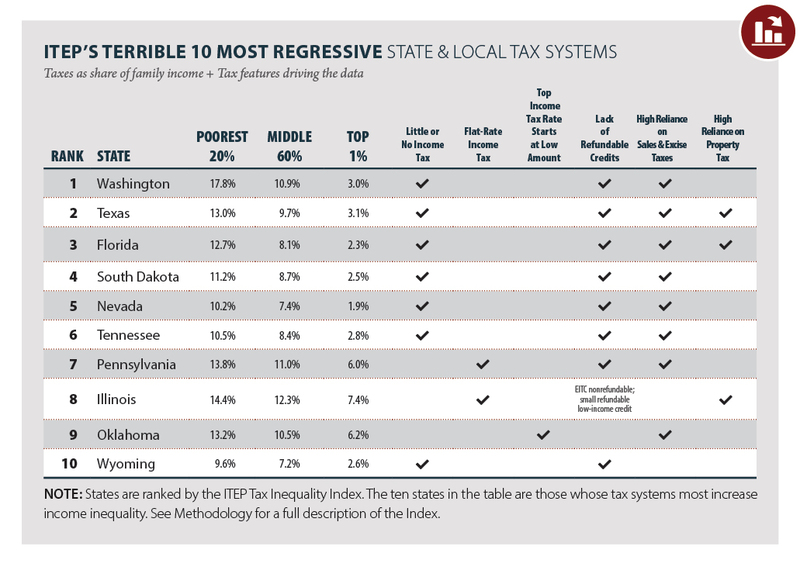 Washington State, on the other hand, has the most regressive state and local tax system. This is largely a result of the state levying no personal income tax and relying heavily on sales and excise taxes — according to the latest available data, these taxes make up over 60 percent of the state’s total tax base. The average state reliance is nearly half that at 35 percent. State personal income taxes — and their counterpart, corporate income taxes — are the main progressive element of state and local tax systems. In 2018, 41 states and the District of Columbia have broad-based personal income taxes that partially offset the regressivity of consumption taxes and property taxes. Yet some states have been more successful than others in creating a truly progressive personal income tax — one in which effective tax rates increase with income. Some states, such as California and Vermont as well as the District of Columbia, have very progressive income taxes. Others have only nominally progressive taxes. Very few states, such as Alabama and Pennsylvania, actually have effectively regressive income taxes. These differences in the fairness of state income taxes are due to four broad policy choices: a graduated or flat-rate tax structure, the use of exemptions and deductions, refundable tax credits that benefit low-income taxpayers, and the use of regressive tax loopholes that benefit the wealthiest taxpayers. Of the states currently levying a broad-based personal income tax, all but nine apply graduated tax rates (higher tax rates applied at higher income levels). Colorado, Illinois, Indiana, Kentucky, Massachusetts, Michigan, North Carolina, Pennsylvania, and Utah tax income at one flat rate. While most of the “Terrible 10” states achieve membership in this club by having no income taxes at all, two of them — Pennsylvania and Illinois — achieve this dubious honor through their use of a flat-rate tax. However, using a graduated rate structure is not enough to guarantee an overall progressive income tax; some graduated-rate income taxes are about as fair as some flat-rate taxes, and some even less fair. The level of graduation in state income tax rates varies widely. As does the level of progressivity. 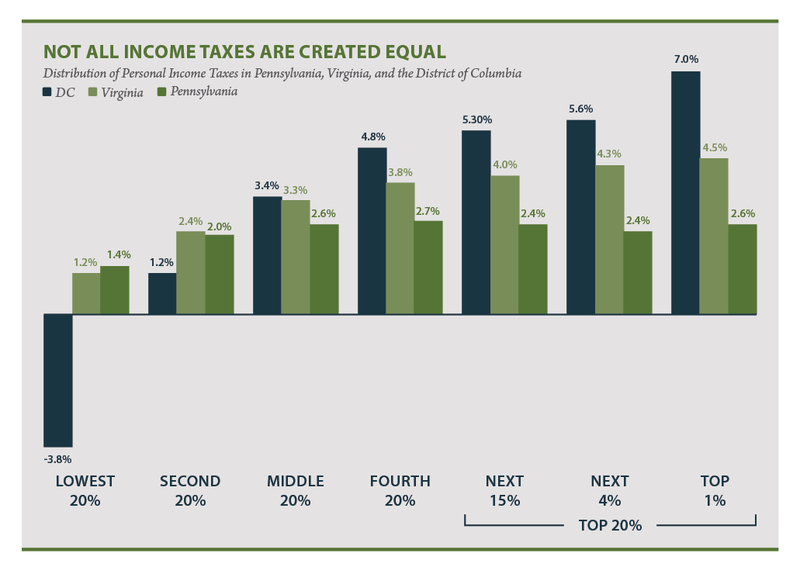 This is illustrated by a look at the income tax structures in the District of Columbia, Pennsylvania, and Virginia, three jurisdictions with income taxes whose wide-ranging structures result in very different distributional impacts. The District of Columbia’s income tax is quite progressive. Its six-tier graduated tax rates range from 4 percent to 8.95 percent. Because the top tax rate of 8.95 percent is a “millionaire’s tax,” most District residents pay a lower top rate. And most of those at the bottom of the income scale are held harmless by a generous Earned Income Tax Credit (EITC) provided at 40 percent of the federal credit for workers with children and 100 percent for workers without children in the home. A neighboring state, Virginia, has a personal income tax with fewer tax brackets (four) over a narrower range (2 to 5.75 percent), and a top rate that begins at a modest $17,000 of taxable income. The tax is progressive across the income scale, but low-income families still pay a comparatively high portion of their income in personal income taxes (The state’s 20 percent non-refundable Earned Income Tax Credit is helpful but does not offset the regressive effects of other taxes paid by low-income families). Further, a family in the top 1 percent, earning an average of $1.4 million dollars a year, pays the same top rate as many families whose wages leave them near or even below the poverty line. Pennsylvania is an example of an income tax structure that does little to improve the state’s tax progressivity. The Keystone State has a flat statutory income tax rate of 3.07 percent, offers no deductions or personal exemptions to reduce taxable income, and does not provide refundable tax credits (the state does offer a tax forgiveness credit that reduces taxes for the very lowest income taxpayers). A key tool that states have available to enhance income tax fairness and lift individuals up and out of poverty are low-income tax credits. These credits are most effective when they are refundable — that is, they allow a taxpayer to have a negative income tax liability which offsets the regressive nature of sales and property taxes — and are adjusted for inflation so they do not erode over time. Twenty-nine states and the District of Columbia have enacted state Earned Income Tax Credits (EITCs). Most states allow taxpayers to calculate their EITC as a percentage of the federal credit. Doing so makes the credit easy for state taxpayers to claim (since they have already calculated the amount of their federal credit) and straightforward for state tax administrators. Refundability is a vital component of state EITCs to ensure that workers and their families get the full benefit of the credit. Refundable credits do not depend on the amount of income taxes paid; rather, if the credit exceeds income tax liability, the taxpayer receives the excess as a refund. Thus, refundable credits usefully offset regressive sales and property taxes and can provide a much-needed income boost to help families pay for basic necessities. In all but five states (Hawaii, Ohio, Oklahoma, South Carolina, and Virginia), the EITC is fully refundable. The use of low-income tax credits such as the EITC is an important indicator of tax progressivity: only two of the ten most regressive state income taxes have a permanent EITC, while all of the ten relatively progressive state income taxes provide a permanent EITC. Because the Earned Income Tax Credit is targeted to low-income families with children, it typically offers little or no benefit to older adults and workers without children. However, we have seen forward momentum on this issue in DC and Minnesota, and more recently in California and Maryland where lawmakers have taken steps to improve the credit for workers without children. Refundable low-income credits that are available to all residents regardless of family status are also good complementary policies to state EITCs. Seven states offer an income tax credit to help offset the sales and excise taxes that low-income families pay. Some of the credits are specifically intended to offset the impact of sales taxes on groceries. These credits are normally a flat dollar amount for each family member and are available only to taxpayers with income below a certain threshold. They are usually administered on state income tax forms and are refundable — meaning that the full credit is given even if it exceeds the amount of income tax a claimant owes. In contrast to states that improve tax fairness with tax credits for low-income families, more than a dozen states currently allow substantial tax breaks for the wealthy that undermine tax progressivity. Two of the most regressive state income tax loopholes are capital gains tax breaks (Arizona, Arkansas, Hawaii, Montana, New Mexico, North Dakota, South Carolina, Vermont, and Wisconsin) and deductions for federal income taxes paid (Alabama, Iowa, Louisiana, Missouri, Montana, and Oregon). In combination with a flat (or only nominally graduated) rate structure, these tax breaks can create an odd —and unfair — situation where the highest income taxpayers devote a lower percentage of their income to income taxes than their middle-income neighbors. For example, Alabama allows a deduction for federal income taxes. Although Alabama’s income tax is essentially flat, the federal income tax is still progressive. So Alabama’s deduction for federal income taxes disproportionately benefits the state’s wealthiest taxpayers. As a result, effective marginal income tax rates in Alabama actually decline at the state’s highest income levels. Despite the 5 percent top tax rate, the effective income tax rate on the very wealthiest taxpayers is actually less than 3 percent. Among the six states that allow a deduction for federal taxes, three allow a full deduction for federal taxes, including Alabama, while the other three have a partial deduction. Wisconsin allows a deduction for 30 percent of most capital gains income. Because capital gains are realized almost exclusively by the wealthiest 20 percent of taxpayers, this deduction makes the state income tax much less progressive. Eight other states allow substantial capital gains tax breaks. What About States Without Income Taxes? Not levying a personal income tax requires tradeoffs that are often detrimental to tax fairness. It is a common misconception that states without personal income taxes are “low tax.” In reality, to compensate for lack of income tax revenues these state governments often rely more heavily on sales and excise taxes that disproportionately impact lower-income families. 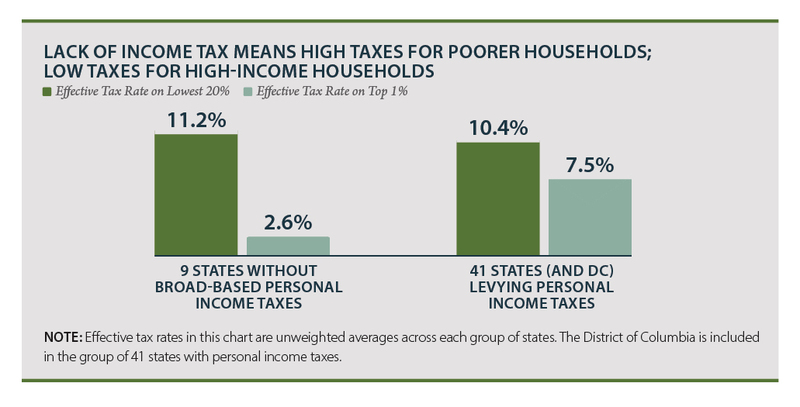 As a result, while the nine states without broad-based personal income taxes are universally “low tax” for households earning large incomes, these states tend to be higher tax for the poor. Note: The nine states without broad-based personal income taxes are Alaska, Florida, Nevada, New Hampshire, South Dakota, Tennessee, Texas, Washington, and Wyoming. Tennessee levies a limited personal income tax that only applies to interest and dividend income; it is set to expire in 2021. 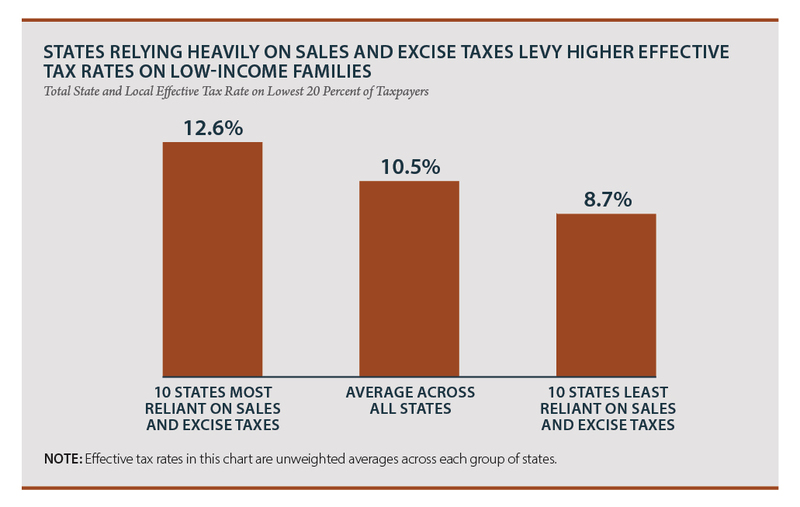 Sales and excise taxes are the most regressive element in most state and local tax systems. Sales taxes inevitably take a larger share of income from low- and middle-income families than from rich families because sales taxes are levied at a flat rate and spending as a share of income falls as income rises. Thus, while a flat rate general sales tax may appear on its face to be neither progressive nor regressive, that is not its practical impact. Unlike an income tax, which generally applies to most income, the sales tax applies only to spent income and exempts saved income. Since high earners are able to save a much larger share of their incomes than middle-income families — and since the poor can rarely save at all — the tax is inherently regressive. The average state’s consumption tax structure is equivalent to an income tax with a 7.1 percent rate for the poor, a 4.8 percent rate for the middle class, and a 0.9 percent rate for the wealthiest taxpayers. Few policymakers would intentionally design an income tax that looks like this, but many have done so by relying heavily on consumption taxes as a revenue source. In New Mexico, Arizona, Alabama, and Alaska, sales and excise taxes account for approximately 50 percent of all revenues. Sales and excise taxes in Texas, Florida, Hawaii, Louisiana, Sound Dakota, and Tennessee make up more than half of all revenues. Washington state and Nevada raise more than 60 percent of all revenue through regressive consumption taxes. This high-reliance on consumption taxes helps land six of these states —Florida, Nevada, South Dakota, Tennessee, Texas, and Washington — on ITEP’s Terrible 10 list of the most regressive state and local tax systems. Which items are included or excluded from the sales tax base is another important factor affecting sales tax fairness. For example, taxing food is a particularly regressive policy because poor families spend most of their income on groceries and other necessities. Of the states that rely the heaviest on consumption taxes, Arkansas and Tennessee both tax food (though at a reduced rate) and Hawaii taxes food at the full rate but with a partially offsetting credit for taxpayers making less than $50,000. Among the twelve states with higher-than-average effective consumption tax rates on the bottom 20 percent, six of them include food in their tax bases. In addition to Arkansas, Tennessee, and Hawaii already mentioned above, South Dakota fully taxes food, and Kansas and Oklahoma both tax food at the full sales tax rate while offering tax credits that do not fully offset the impact of the tax. Unlike sales taxes that are usually calculated as a percentage of the price of a fairly broad base of taxable items, excise taxes are imposed on a small number of goods, typically ones for which demand has a practical per-person maximum (for example, one can only use so much gasoline). Thus, wealthy people don’t keep buying more of these goods as their income increases. Moreover, excise taxes are typically based on volume rather than price — per gallon, per pack and so forth. Thus, better-off people pay the same absolute tax on an expensive premium beer as low-income families pay on a run-of-the-mill variety. As a result, excise taxes are usually the most regressive kind of tax. Overall, state excise taxes on items such as gasoline, cigarettes and beer take about 1.7 percent of the poorest families’ income, 0.8 percent of middle-income families’ income, and just 0.1 percent of the income of the very best-off. In other words, these excise taxes are 17 times harder on the poor than the rich, and 8 times harder on middle-income families than the rich. In addition to being the most regressive tax, excise taxes can be relatively poor revenue-raising tools because they decline in real value over time. Since excise taxes are levied on a per-unit basis rather than ad valorem (percentage of value), the revenue generated is eroded by inflation. That means excise tax rates must continually be increased merely to keep pace with inflation, not to mention real economic growth. Policymakers using excise tax hikes to close fiscal gaps should recognize that relying on excise tax revenues means balancing state budgets on the back of the very poorest taxpayers — and that these revenues represent a short-term fix rather than a long-term solution. For average families, a home represents the lion’s share of their total wealth, so most of their wealth is taxed. At high income levels, however, homes are only a small share of total wealth, which mostly consists of stock portfolios, business interests, and other assets that are generally completely exempt from property taxes. For homeowners, home values as a share of income tend to decline at higher incomes. A typical middle-income family’s home might be worth three times as much as the family’s annual income, while a rich person’s home might be valued at one-and-a-half times his or her annual income or potentially much less. Property taxes paid by businesses reduce the regressivity of the property tax as they generally fall on owners of capital and to a significant degree are “exported” to residents of other states. On average, this study finds that about 40 percent of a typical state’s property taxes fall on business (excluding the portion of taxes assigned to renters). The most common form of broad-based state property tax relief for homeowners is the homestead exemption, which usually exempts a flat dollar amount or flat percentage of home value from property tax. Some states apply the exemption only to certain types of property tax levies, such as school taxes, while other states apply the exemption to all homeowner property taxes. Allowing a generous homestead exemption is what sets less regressive property tax systems apart from the most regressive. While several states have increased the value of their homestead exemptions in recent years, many others have allowed the real value of their homestead exemptions to diminish, as increasing home values made fixed-dollar exemptions less valuable. LOW TAXES OR JUST REGRESSIVE TAXES? 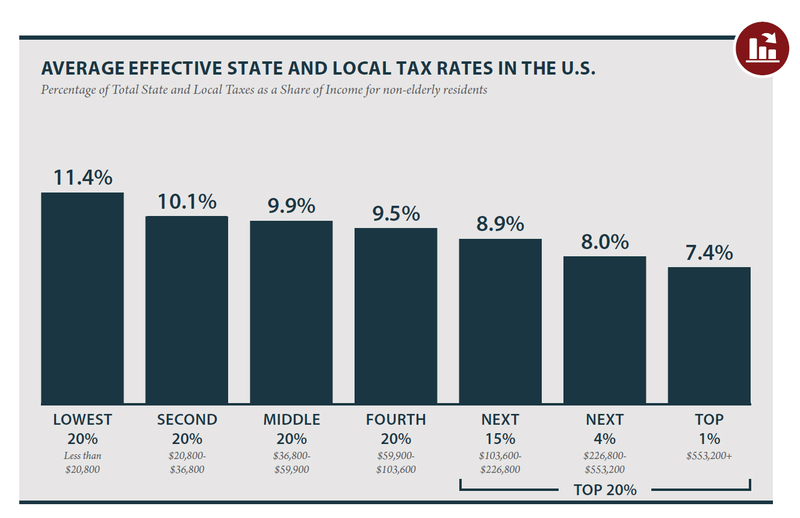 This report identifies the most regressive state and local tax systems and the policy choices that drive that unfairness. Many of the most upside-down tax systems have another trait in common: they are frequently hailed as “low-tax” states, often with an emphasis on their lack of an income tax. But this raises the question: “low tax” for whom? No-income-tax states like Washington, Texas, and Florida do, in fact, have average to low taxes overall. However, they are far from “low-tax” for poor families. In fact, these states’ disproportionate reliance on sales and excise taxes make their taxes among the highest in the entire nation on low-income families. Figure 10 shows the 10 states that tax poor families the most. Washington State, which does not have an income tax, is the highest-tax state in the country for poor people. In fact, when all state and local taxes are tallied, Washington’s poor families pay 17.8 percent of their income in state and local taxes. Compare that to neighboring Idaho and Oregon, where the poor pay 9.2 percent and 10.1 percent, respectively, of their incomes in state and local taxes — far less than in Washington. Arizona and Texas, both of which rely heavily on consumption taxes, tie for sixth highest taxes on the poor in the nation, at 13.0 percent. Florida is not far behind, as its 12.7 percent tax rate on the poor ranks ninth highest. The bottom line is that many so-called “low-tax” states are high-tax states for the poor, and most do not offer a good deal to middle-income families either. Only the wealthy in such states pay relatively little. Who Pays? examines how, and from whom, state and local governments collect tax revenue. But non-tax revenue is largely excluded from the analysis. Non-tax revenue can include fees, fines, service charges, or any other monies that are collected by a state or local government outside of the tax code. Non-tax revenue is often based on consumption by residents rather than ability to pay. For example, public parking is charged based on the purchase of a service, and is charged at the same rate regardless of one’s income. Generally speaking, non-tax revenue tends to be a regressive revenue source. As more states and localities seek to cut or avoid raising taxes, many have increased their reliance on fees thus making most state and local tax codes even more regressive than this study shows. See Appendix C for a ranking of states based on their reliance on non-tax revenue vs. tax revenue. The main finding of this report is that the vast majority of state and local tax systems are fundamentally unfair. An overreliance on consumption taxes and the absence of a progressive personal income tax in many states neutralizes whatever benefits the working poor receive from refundable low-income tax credits. The bleak reality is that even among the growing group of states that have taken steps to reduce the working poor’s tax share by enacting state EITCs, most still require their poorest taxpayers to pay a higher effective tax rate than any other income group. The results of this study are an important reference for lawmakers seeking to understand the inequitable tax structures they have inherited from their predecessors or helped enact themselves. States may ignore these lessons and continue to demand that their poorest citizens pay the highest effective tax rates. Or, they may decide instead to ask wealthier families to pay tax rates more commensurate with their incomes. In either case, the path that states choose will have a major impact on the well-being of their citizens — and on the fairness of state and local taxes. The sixth edition of Who Pays?, unless otherwise noted, shows the impact of permanent tax laws on non-elderly taxpayers, including the impact of all tax changes enacted through September 10, 2018, at 2015 income levels. The state pages show state-by-state estimates of the distribution of state and local taxes by income group for non-elderly taxpayers. For each state, two pages of tax information are presented. The first page for each state shows the distribution of state and local taxes in tax year 2018, unless otherwise specified. In each distributional chart, the non-elderly population is divided into income quintiles (groups of 20 percent of the population). The highest-income quintile is further subdivided into three groups: the top 1 percent, the next highest 4 percent, and the next 15 percent. This is done because the highest-income quintile received 61 percent of all income in 2015 (the year of our income data) — and because income is distributed unequally within the top quintile. The large chart at the top of each page shows total average state and local taxes by income group. In a departure from past analyses, we no longer present this information post-federal offset due to policy changes under the federal Tax Cuts and Jobs Act that temporarily limited the extent to which the federal deduction for state and local taxes (SALT) functions as a generalized offset of state and local taxes. Three smaller charts appear below it and show the distribution of each state’s sales and excise, personal income, and property taxes by income group. The second page includes additional charts and information that help clarify the distribution of state and local taxes including a detailed table of Who Pays? results, ITEP’s Tax Inequality Index ranking, and tax code features that drive the data in each state. The Institute on Taxation & Economic Policy has engaged in research on tax issues since 1980, with a focus on the distributional consequences of both current law and proposed changes. Much of ITEP’s research, including this report, is based on ITEP’s proprietary microsimulation tax model, which estimates the amount of federal, state and local taxes paid by residents of every state at different income levels under current law and alternative tax structures. Since 1996, ITEP has published a series of reports that measure and compare the fairness, or incidence, of state and local taxes in all fifty states and the District of Columbia. The reports, entitled “Who Pays?,” each show a single-year snapshot of state and local tax incidence, including the effects of all enacted tax changes. This is the sixth edition of this report. In general, the results of these reports are not strictly comparable with prior editions because of frequent improvements to the model’s data sources and methodology. The report shows the effect of current state and local tax laws, reflecting the effect of tax changes enacted through September 10, 2018. This includes the effect of automatic changes in state tax policy related to “The Tax Cuts and Jobs Act,” Pub. L. No. 115-97, as well as law changes enacted in dozens of states in the wake of that law. In cases where tax changes enacted have not yet taken full effect, we model changes as if they were already fully implemented (we do not include tax changes dependent on a revenue trigger). This choice ensures that our analysis reflects the real long-term fairness challenges facing each state’s tax system. A notable exception to this rule is state responses to the recent United State Supreme Court decision in South Dakota v. Wayfair, Inc. (2018), which clarified the conditions under which state sales and use taxes can be applied to sales made by businesses with no physical presence in the state. While several states have already enacted reforms designed to bolster sales and use tax collections in response to this ruling, the likely revenue impact of these changes is unclear. For this reason, our analysis excludes the impact of Wayfair-related reforms. 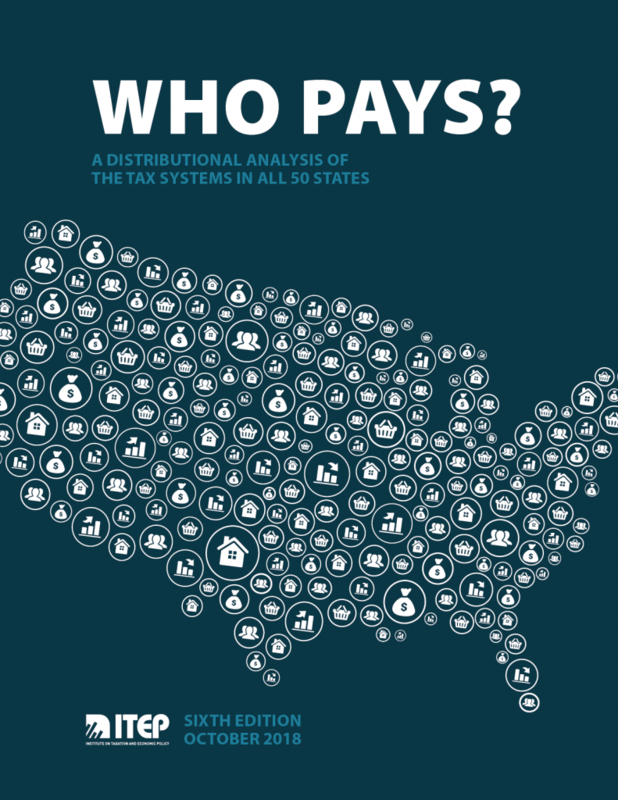 The report’s universe of taxpayers includes most, but not all, of the residents of each state. We exclude elderly taxpayers, dependent filers, and those with negative incomes; all other Americans living in each of the fifty states and the District of Columbia are included. These exclusions mean the report’s universe includes all non-elderly taxpayer units, including single taxpayers, families headed by married couples, and families headed by single parents. The report focuses on the major state and local taxes levied in each state and in the District of Columbia. The report breaks these taxes into three broad groups: consumption taxes, including general sales taxes and specialized excise taxes; property taxes, including taxes on homes, businesses and motor vehicles; and income taxes paid by individuals and businesses. To provide a clear picture of the policy choices within the reach of each state’s lawmakers, the report looks only at how the taxes collected by a given state fall on that state’s residents, excluding the impact of taxes levied by other states. The taxes included in this report represent about 90 percent of all state and local taxes collected in 2015. The report includes the statewide general sales and use taxes levied by 45 states and the District of Columbia. The report also includes the local sales and use taxes currently levied by about two-thirds of the states. Where the base of these local taxes differs from the base of the state tax, the differences are reflected in our analysis. The analysis includes excise taxes on alcohol, tobacco, and motor vehicle fuels, each of which are levied by all the states and many local governments. In the increasing number of states and localities now levying special excise taxes on soft drinks or recreational cannabis, these taxes are included as well. The report also includes the effect of indirect consumption taxes: the sales and excise taxes that are paid initially by businesses rather than individuals. These taxes are usually passed through to consumers in the form of higher prices; a substantial fraction of these taxes are exported to these businesses’ customers in other states, which means a share of these taxes are excluded from our presentation of the distributional impact of each state’s taxes on its own residents. State and local governments levy taxes on real property (e.g., homes) and, in some states, on personal property such as motor vehicles. While locally-administered rates can vary substantially within a state, our analysis models a uniform statewide-average tax rate on real and personal property in each state. This is necessary because the ITEP microsimulation model’s unique identifiers for each record include geographic information only on the state of residence. Property taxes on rental property are distributed partly to property owners and partly to tenants. The analysis of motor vehicle property taxes includes the effect of charges levied on taxpayers registering motor vehicles, as these are close substitutes for tax policies such as value-based vehicle property taxes and even motor fuel taxes. The analysis also includes taxes levied by some states on estates and inheritances. A substantial share of real and personal property taxes are paid initially by businesses, and these taxes are ultimately passed through to individual business owners and/or the customers and employees of these businesses. The analysis calculates the share of property taxes falling initially on businesses — including but not limited to real property taxes, tangible personal property taxes, and inventory taxes — and allocates these taxes to residents according to their shares of capital income, wages and consumption. As is the case with the corporate income tax and consumption taxes, a substantial share of the business property tax is exported to residents of other states and is therefore excluded from our presentation of the distributional impact of each state’s taxes on its own residents. Forty-one states and the District of Columbia levy broad, statewide taxes on personal income, usually based partly on federal rules. Local governments in more than a dozen states also levy income-based taxes, either on local wages or the same broad measure of personal income used at the state level. Each of these taxes are included in the analysis. Most states also levy entity-level taxes on corporations, usually based primarily on the amount of profits reported in the state. These taxes are also sometimes based on the value of capital stock in each state. The report includes all of these taxes. Most of the final incidence of these taxes is assumed to fall on owners of corporate stock, and about a quarter is assumed to fall on workers in the form of lower wages. Since most of the taxes paid on corporate income are typically paid by large, multi-state corporations with sales and employees in many states, a significant fraction of the corporate income tax incidence is exported to other states, and thus excluded from our presentation of the distributional impact of each state’s taxes on its own residents. There are two broad ways in which a distributional analysis can sort taxpayers by income level. One approach, used by legislative fiscal analysts in most states, uses income definitions based on “Adjusted Gross Income.” In this approach, the starting point is the income that is actually subject to income taxes in a given state. The other approach, used by ITEP, is to use a more universal income definition, including both income that is subject to tax and income that is exempt. For components of income that are subject to income taxes, ITEP relies on information from the Internal Revenue Service’s “Statistics of Income” publication, which provides detailed state-specific information on components of income at different income levels. For components of income that are either fully or partially tax-exempt, ITEP uses data from the Congressional Budget Office and the Current Population Survey to estimate income levels in each state. The generally non-taxable income items for which ITEP makes state-by-state estimates (which are included in our measure of “total income”) include: Social Security benefits, Worker’s Compensation benefits, unemployment compensation, VA benefits, child support, financial assistance, public assistance, and SSI. It’s widely understood that taxpayers at all income levels tend to under-report certain income categories, especially capital gains, pass-through business income, rental income and farm income. For this reason, ITEP’s modeling incorporates estimates of the amount of unreported income of each type. This unreported income is included in our “total income” estimates for each state. The best-off 20 percent of Americans enjoyed more than half of nationwide personal income in 2015, according to ITEP’s estimates. The best-off 1 percent of taxpayers alone enjoyed 19 percent of nationwide personal income. (By contrast, the poorest 20 percent of Americans earned about 3 percent of nationwide income.) This means that incremental differences in the tax treatment of the best-off taxpayers can have substantial implications for state tax collections. Moreover, many states have rules in place that provide special tax breaks for capital gains and other income sources that are highly concentrated in the hands of the best-off 1 percent. An analysis showing the impact of a capital gains tax break on families in the top 20 percent of the income distribution would gloss over the substantial differences in how such a tax break treats taxpayers residing at various points throughout the top 20 percent. The analyses contained in this report show the tax incidence of singles and couples, with and without children, who are under the age of 65. State tax structures routinely treat elderly families more generously than other families; for this reason, including seniors in distributional analyses of state tax systems can present an inaccurate view of how tax systems affect most families. Virtually every state conforms to at least one of the federal government’s elderly income tax breaks. All 41 states and the District of Columbia that levy broad-based income taxes follow the federal exemption for Social Security benefits, with many states exempting them altogether. Many states allow their seniors to claim the same higher federal standard deduction. But most income tax states go far beyond these tax preferences inherited from federal income tax rules to allow special elderly-only tax breaks of their own. Thirty-six states allow an income tax exemption for private or public pension benefits. These range from fully exempting all pension benefits for adults above a certain age (three states — Illinois, Mississippi, and Pennsylvania) to only exempting very specific benefits such as those for military veterans. More than a dozen states allow senior citizens an extra personal exemption or exemption credit, allowing these taxpayers to shelter twice as much of their income from tax as similar non-elderly taxpayers can claim. For example, Illinois exempts all pension and retirement income from their tax base which costs the state more than $1 billion annually. If retirement income were taxed, the middle twenty percent of Illinoisans would see a tax increase equivalent to 0.2 percent of their income on average. Those in the next quintile would see their taxes increased by 0.3 percent of their income. State and local property tax laws also provide tax breaks for senior citizens that can dramatically change the apparent incidence of property taxes. Because so many states offer special consideration for elderly taxpayers, including elderly families in the Who Pays? analysis would not give an accurate depiction of how the tax structure treats the majority of taxpayers. The ITEP Tax Inequality Index measures the effects of each state’s tax system on income inequality. Essentially, it answers the following question: Are incomes more or less equal after state taxes than before taxes? For each state, the index compares incomes by income group before and after state and local taxes. The index for each state equals one minus the average of the following ratios: 1) the after-tax income of the richest 1 percent as a share of pretax income over the after-tax income of the poorest 20 percent as a share of pretax income; 2) the after-tax income of the richest one percent as a share of pretax income over the after-tax income of the middle 60 percent as a share of pretax income; and 3) the after-tax income of the best-off 20 percent as a share of pretax income over the after-tax income of the poorest 40 percent as a share of pretax income, half-weighted. States with regressive tax structures have negative tax inequality indexes, meaning that incomes are less equal in those states after state and local taxes than before. In states with positive tax inequality indexes, incomes are at least somewhat more equal after state and local taxes than before. What happened to the federal offset? Unlike previous editions of Who Pays?, this 6th Edition does not include a “federal deduction offset” because of restrictions placed on the deduction by the Tax Cuts and Jobs Act. Specifically, the increased standard deduction will deny its benefits to most previous claimants, and the $10,000 cap on the deduction means that for most current claimants, the deduction will not vary significantly in proportion to state and local taxes paid. The combined result of these two changes is that the deduction no longer functions as a generalized offset of state and local taxes. These federal policy changes are in place temporarily, through the end of 2025. Comparisons to previous versions of Who Pays? The methodology used in this study is broadly similar to the approach used in previous editions of the report. However, we have recently made several methodological improvements impacting both income estimation and tax modeling. For this reason, we discourage direct comparison of the report’s results with prior editions. The effective tax rates calculated in this report also differ, in many states, from those reported in prior editions of the study because of changes attributable not to state and local tax laws but to the business cycle. Cyclical trends in components of personal income such as capital gains realizations are especially pronounced, for instance. Long-run structural issues can also lead to changes in tax incidence over time, even absent specific changes in tax law. For example, some states’ effective sales tax rates show a visible decline from the previous edition because their sales tax collections have shrunk substantially, as a share of income. This trend reflects the outdated, slow-growing tax bases in use in most states. The ITEP model is a tool for calculating revenue yield and incidence, by income group, of federal, state and local taxes. It calculates revenue yield for current tax law and proposed amendments to current law. Separate incidence analyses can be done for categories of taxpayers specified by marital status, the presence of children, and age. The Consumption Tax Model analyzes the revenue yield and incidence of current sales and excise taxes. It also has the capacity to analyze the revenue and incidence implications of a broad range of base and rate changes in general sales taxes, special sales taxes, and excise taxes on products such as gasoline and tobacco. There are more than 250 base items available to amend in the model, reflecting, for example, sales tax base differences among states and the impact of proposed expansions or reductions in the base. The Corporate Income Tax Model analyzes revenue yield and incidence of current corporate income tax law, possible rate changes and certain base changes. The majority of the corporate income tax is assigned to owners of corporate stock, with the remainder falling on labor income. Local taxes: The model can analyze the statewide revenue and incidence of aggregate local taxes (not, however, broken down by individual localities). This capacity is especially important for taxes on real and personal property, which are almost entirely levied at the local level.